Smoked Salmon, served the traditional way, Thyme for Cooking gourmet starter. This is not meant to be done with the dry-smoked, shrink- wrapped 'Cajun (or whatever) salmon. It is meant to be the moist, European kind that is either pre-sliced or sliced off a whole salmon in paper thin slices. You will want 2 - 3 slices per person depending on how big the slice. The serving should almost cover the plate. If you have never tried this kind now is the time! If you are having salad tomorrow will want 1/2 to 2/3 as much as for this. Dry white wine or Champagne is best. Boil eggs - can be done earlier in the day. Finely chop egg whites and yolks, keeping separate or simply quarter. To serve: Lay salmon out on plates, put bread points around salmon. 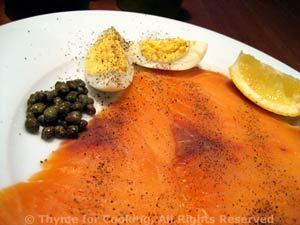 Arrange eggs, onion and capers around salmon on each plate. Quarter lemon and put 2 quarters on each plate. To eat: Squeeze the lemon over the salmon and enjoy with bread and garnishes.